The UN’s 18th Climate Change Conference in Doha, which began November 27 has concluded. Ecosystem Marketplace covered the events extensively focusing on the outcome of the REDD text. Brazil Says It Slowed Deforestation: Challenges Others To Follow Suit The Brazilian delegation discussed its record low deforestation rates and how these rates will impact negotiations at Doha. Indigenous Leaders Embrace REDD, With Or Without Carbon Markets Indigenous leaders spoke in favor of a program aiming to save 400 hectares of endangered rainforest through an ecosystems-based valuation approach. REDD+ Sidelined In Dispute Over Verification The REDD text was vetoed after passing the scientific negotiating track over the amount of verification recipient REDD countries will be subject to, opening up the possibility that an agreement on REDD may be postponed another year. Gold Standard and Fairtrade Broaden Market Access For Small Producers The carbon standard and ethical label are teaming up to bring carbon income to small producers practicing sustainable agriculture hoping to nurture both climate and people. Congo Basin Forest Fund Steps Up For REDD+ Piloting The Democratic Republic of Congo introduced its National REDD+ Strategy in Doha. This article takes an in-depth look at the nation’s main source of funding-the Congo Basin Forest Fund. Powerful Forest Friends Deliver Indonesian Approval Of Landmark REDD Project Indonesia’s first REDD project that will protect 80,000 hectares of rainforest has been approved after being put on hold for one year. REDD Limps Out Of Doha-Heavy, Homeless, And Broke REDD negotiators approved new provisions on how to recognize non-carbon benefits but were unable to agree on how to verify emissions reductions or on the creation of a REDD committee. REDD Inches Forward In Doha Gateway, But Attention Shifts To National Solutions is the last piece of coverage from Doha explaining the setbacks and accomplishments of COP 18 as well as where REDD stands. Panelists Explore Post-Doha Prospects for Bridging Global Climate Finance Gap offers an analysis on Doha’s impact on climate finance from the perspective of industry leaders a month after the event. The Rimba Raya REDD Project is on again – one year after being put on ice when Indonesia’s Ministry of Forestry promised half the project’s territory to a palm oil company. That decision has now been reversed, and the project is set to preserve an orangutan habitat the size of Singapore, generating millions of dollars in carbon income for local communities along the way. 6 December 2012 | Doha | Qatar | It was a fitting end to a topsy-turvy year for Todd Lemons and Jim Procanik. As co-directors of carbon project developer InfiniteEARTH, they spearheaded the Rimba Raya Biodiversity Reserve REDD Project, a ground-breaking endeavor that will conserve 80,000 hectares of rainforest and generate 104 million credits over 30 years and was finally green-lighted last week. The announcement became official at climate talks here, a little more than a year after the Ministry of Forestry said it was giving half the project’s territory to a palm oil company. Reuters credits the Ministry of Forestry’s reversal to intervention by Singapore-based businessman Rusmin Widjaja, Central Kalimantan governor A. Teras Narang, and Triwatty Marciano, whose husband, Marciano Norma, heads Indonesia’s State Intelligence Agency. Whatever its cause, the decision could keep tons of carbon locked in peat swamps while habitat for one of the world’s last wild orangutan populations will remain undisturbed. Rimba Raya is the world’s first REDD project on deep peat and Indonesia’s first REDD project and could funnel billions of dollars into community development projects that provide access to clean water, childhood development, health services, reforestation and eco-tourism. It’s located in the tropical peat swamp forest on the island of Borneo in Central Kalimantan province in Indonesia – a country with the highest rate of deforestation in the world, according to the 2008 and 2009 Guinness Book of World Records, although Yuyu Rahayu, the Ministry of Forestry’s Director of Forest Resources Inventory and Monitoring, speaking at a side event here last night, said that deforestation has plunged dramatically in the last three years, and that the country was on track to reduce its deforestation rate by 26%. Central Kalimantan has the world’s fastest rate of forest conversion to palm oil plantations, says Indonesia Forest Watch. The Biodiversity Reserve also houses six species of endangered mammals-one of those being the orangutan. Saving Indonesia’s forests are crucial to fighting climate change. Its forests and peat swamps release huge amounts of carbon when they are cleared and drained. “I am happy with the work progress in Jakarta and soon enough we can focus on the important work of community development and orangutan habitat conservation in the Rimba Raya project area,” says Procanik. The area is also home to hundreds of threatened and endangered species of flora and fauna. 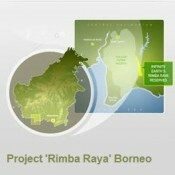 In 2010, Rimba Raya had hit several milestones. It was verified and validated under the VCS (Verified Carbon Standard) and the CCBA (Climate Community and Biodiversity Alliance), was the first project to develop a REDD methodology and was on track to become the first REDD project to issue credits. The energy giant, Gazprom, invested in the Rimba Raya project saying they had buyers lined up while both Indonesia’s president and the governor of Central Kalimantan endorsed it. But the Ministry of Forestry unexpectedly said it was giving almost half of the project’s territory to PT Best Group for palm oil development in 2011. Shortly afterwards, Indonesia’s Corruption Eradication Commission was sent to investigate the concession process. The Ministry said it was skeptical of InfiniteEARTH’s economic development projections, and it argued that the financial benefits of converting forests into palm oil plantations and other development projects outweighed payments for ecosystem services, like water filtration and carbon storage, they would receive if the forests were left intact. “Mutual friends, that both parties trust, have facilitated a dialog between our two companies and we now understand that Rimba Raya and its developers, InfiniteEARTH,represent a new breed of conservationists that recognize Indonesia’s right to develop its natural resources,” says Winarto Tjajadi, who runs PT Best along with his brother. InfiniteEARTH said in a statement the Rimba Raya Biodiversity Reserve is a benchmark for everything REDD can accomplish and Indonesia has now cleared the way for that to happen.